We are working on a quilt with a history. I suppose that isn’t so surprising. Many quilts have history. Do you remember that beautiful one made by an elderly quilter from Gee’s Bend? It was pieced from her husband’s old work clothes. She said every time she got under that quilt, she felt as though her husband was still with he r.
The quilt we are working on now came from Kentucky. The brother of a friend sent it to me. The women at the Historical Village think the fabrics are from the 1940s. When it arrived in the mail, the top pieced with colored fabric and squares of plain muslin was stiff with age. Bev carefully washed it and washed it, finally getting it to a point where it could be quilted. We found a large piece of muslin for the back. But how to quilt this slightly irregular beauty? The pieced blocks are delicate and also aren’t exactly square. At the same time the colors and patterns are special enough we wanted to do more than simply tie it. So Cathryn in her wisdom pointed out that we could quilt the plain squares and tie the remainder. What a perfect plan for this unique quilt! A pattern with small hearts was selected. It is a bit slow as the fabric tends to hold the needle but we are getting there. It might be finished by late spring. It is one of those quilts that has a lot of character although who is to say how long it might last. Still it will easily grace whatever bed it ends up on. Hopefully the person sleeping under it will feel cared for. Doing this quilt is a reminder how it is not always necessary to stick with the usual plan. Sometimes a dilemma presents itself that requires creative thinking. The solution doesn’t have to be !00% of this. It could be 81% of this and 12% of that and 7% of something else, still getting the job done well. Somebody might have looked at this particular quilt top and thought it wasn’t worth saving for much of anything. But as we quilt and tie it, the women remark on the fabrics and interesting piecing. We figured out a solution and are making it work. Yes indeed, it’s a beauty. 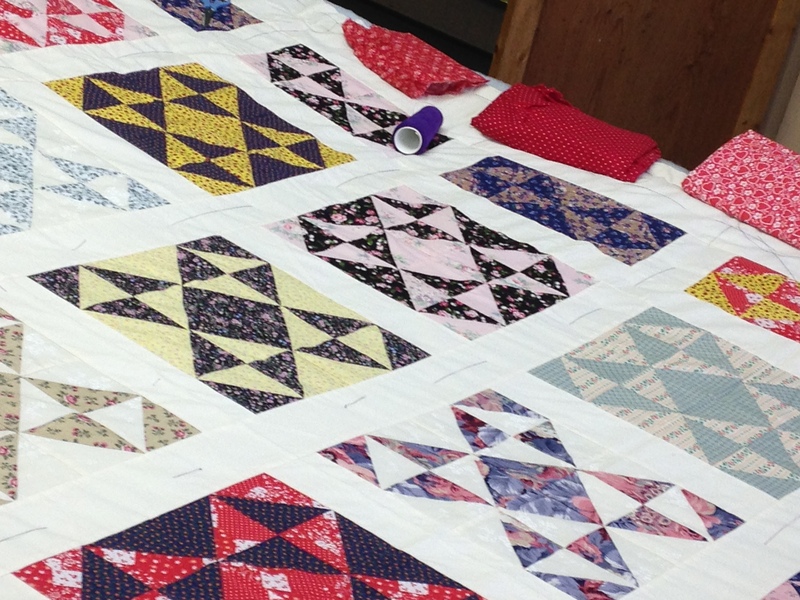 As the women at the Historical Village hand quilt, we realize we are different from those who do machine quilting. We don’t have an attitude about it. We simply see it as two variations on a theme. There are those who like to sew patterns by hand and there are those who like to create their magic with a sewing machine. Despite my six years with the hand quilters, I must admit that was the only dstinction I thought about when it came to quilting. Yes, there were quilts with countless small pieces in intricate designs compared to others that are more traditional log cabin or bear paw patterns. As I am fairly new (some of the original quilters in this group began sewing in the old school house back in the1970s), I sew where I am told, the design I am given and try my hardest to make small even stitches. Then a few weeks back someone suggested we each put together three 12 inch blocks which then could be built into a lovely quilt. Sally went through all our boxes of fabric picking out those she thought went well together. These were laid out so each of us could take the amount needed for our individual squares. Then the discussion began. Most of the women examined the fabrics, picked up some of this and some of that, talked about which patterns they would use for their blocks and they were ready A few brave souls declared they were not going to make blocks, they hadn’t signed on for that. Period. And so a few of the block-making talented women said they would each make six blocks to make up the difference. And then there were two of us who looked like deer caught in the headlights. Make a quilt block? I hand stitched what I was told to do but now I was expected to actually put together a block of pieces and have them lay flat and have their corners match? Dianne and I grumbled about it while quilting that day. But at the end of the day, we both picked up fabric to take home. After all, this was a project for the Historical Village. We were adults who had access to YouTube and books. Surely we would mange. Dianne’s blocks turned out beautifully. The corners were mitered perfection. She quietly told us the names of the patterns she used. We sighed in delight. I will admit that I did not use a pattern. I did not even look at a book with suggestions. I did make three blocks. I just started sewing hoping for the best. When I got to the old school house, I buried my blocks deep in the pile. But of course when the women went through the pile later to begin laying them out, they found mine which someone kindly called ‘free form’. Mary Louise told me straight lines and neat corners could be boring. I felt a bit like a grade school student bringing home art for the refrigerator. We currently are stitching a couple other quilts. I suspect it will be spring or even the fall before we get around to quilting this one. I have no doubt it will be lovely though. And special with most of us represented in our own way and yet part of a larger whole. It is March and yes, the Hawaiian fabric quilt is so close to being finished that we can taste it. 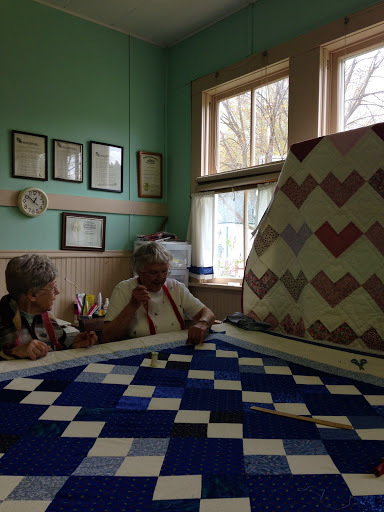 When that quilt was rolled in so much it was hard to get more than a few women sewing on it, we set up another one that Cathryn pieced and some of the women worked on that getting it tied. It is lovely with just enough different fabrics to make it interesting and yet those vintage squares are bordered with white so it gives one a sense of light. We just about got that finished when Sally brought in squares for a quilt she is piecing. She wanted our opinions (brave woman!) and to lay it out. So we put a sheet on top of Cathryn’s quilt and began to play with the squares. Lots of laughter and pointing and rearranging and total agreement that it was going to be a beautiful one when finished. I am sure Sally’s skills as an artist help her select colors and fabrics pleasing to every eye. So here we are in March and moving right along with the quilts. The weather still prevents a few of our regular quilters from joining us. Just too much snow and ice out in the parking lot and on the trail to the old school house. But the snow is slowly turning to mud and the sun coming through the school house windows reassures us spring is on the way. That helps but then with thoughts of spring come thoughts of summer and what that means. One of the old buildings here needs to be re-roofed. The grounds at the Historical Village need to be maintained which requires hiring someone. Lynda starts making lists of all that needs to happen before the summer season starts. Each item requires volunteer efforts or hiring professionals. Our Christmas bazaar went well and we will have another sale over Rendezvous weekend (April 28-29) and then one in May. 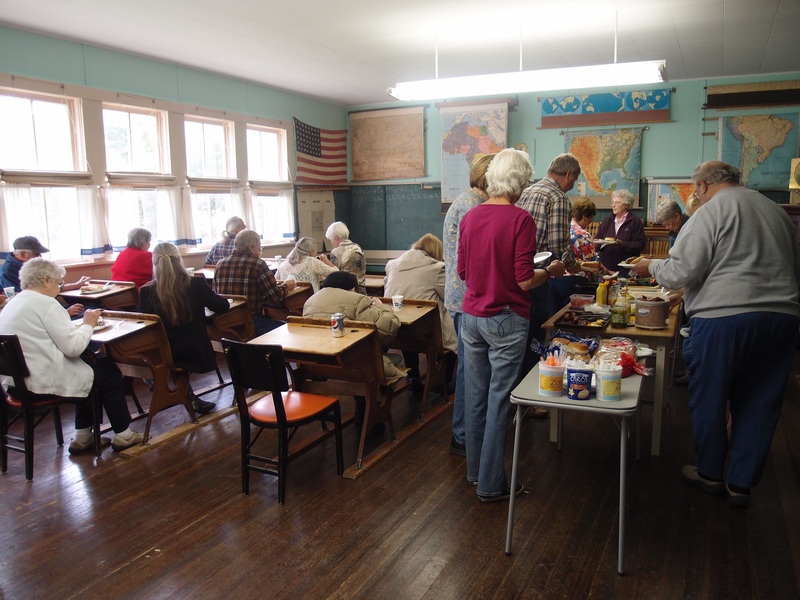 It requires selling quite a number of used books and lovely handmade potholders to pay for a roof or to have the restrooms serviced. Perhaps one of these lovely quilts will sell. There are days when it is hard to put this in perspective. Politicians, billionaires, and Congress talking about millions there and more millions over there. Here in the Tobacco Valley I think of families who struggle to pay utility bills, individuals who don’t have gas money to drive to the doctor’s, men sitting home out of work. The Historical Village is in a county that certainly has its share of hardships. But there are these women making quilts to sell, piecing lovely fabric, making lists for summer chores. The Historical Village has officially opened for the season. Everyday until Labor Day from 1:00 – 5:00pm a volunteer docent is there to unlock all the buildings and explain a bit about the valley to anyone who happens to stop by. There are handmade items in the museum shop for sale: quilts, embroidered pillow cases, pine needle baskets and cards. Today when I went over there were a few Canadian visitors meandering through the various buildings and a young child on the swing set. The grass was so soft and green it surprised me. The child looked completely happy urging her mom to push her again and again. It felt like summer had officially arrived although it is still only May. The seasons change. There are things to miss about our regular Fridays in the winter when we mostly had the Village to ourselves. 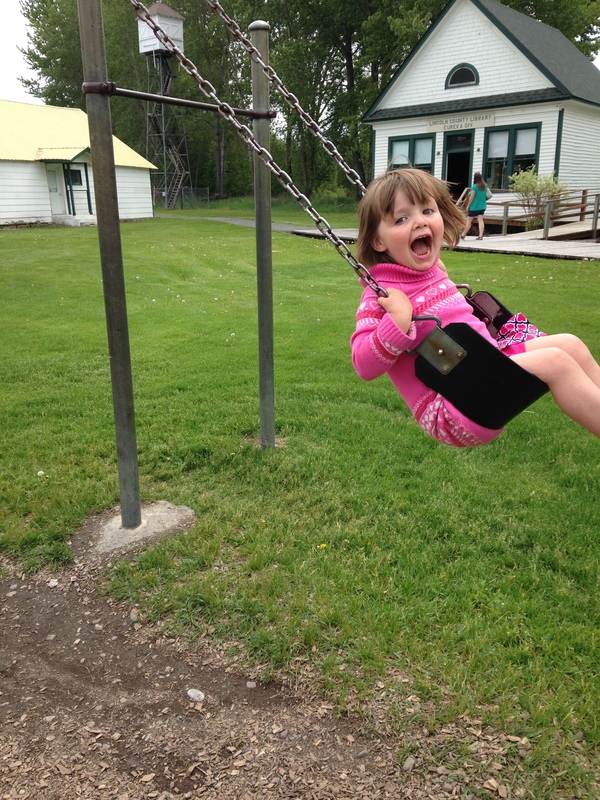 But then there is the child so thoroughly enjoying her moment on the swing. The lawn which was treacherous with ice and snow just a few months ago is now this lovely carpet that begs you to sit down for a spell. Some good friends have left the community. Some new babies have been born. The seasons change. The other day we had the old school house set up for our annual book sale and so had pushed the one quilt frame off to the side. Those of us working that day could then either sell books or sit and quilt. At one point Joan was quilting and explaining the technique to the various folks who stopped to watch her. We actually had three quilts out: the blue one we are currently working on, the one with hearts we are raffling off this year, and the lovely one we just finished that we are selling. The price tag is $1000 and we all agree it has a lot and I mean A LOT of work in it. Its a beauty though and I figure it only takes one person to walk in, see it, really appreciate it and take out a check book. Anyhow so there was Joan explaining how hand quilting is done and how many stitches to the inch. One woman who just moved to the area was interested in learning and said she might join us in the fall when we start up again. She was explaining how she probably wouldn’t be a fast quilter but would try her best. Joan pointed out that yes Fridays are about quilting but they are also about therapy. At that moment I realized once again how smart Joan is. Of course it’s about therapy! Sitting around the quilting frame, relaxed and stitching, talking and listening and laughing. If only we could market this, we wouldn’t have to raffle quilts. But of course I also believe that it’s valuable for people to own these quilts. Each quilt somehow holds all that energy and thoughtfulness that the women give in taking those thousands upon thousands of stitches. And the laughter and the tears and the kindness. All of that gets absorbed into the quilt as we sit around the frame. So yes, even if we could market quilting therapy, we would still want people to buy quilts so they could take this magic home to put on their bed. The quilt we finished up for Kathy Ingram came off the frame and we began putting on the next one. This is one that Bonnie put together although many of the women helped with piecing the blocks. Its quite large – some discussion if it was a queen or king size but we all agreed it was large. And Cathy had sewn the back and we have a piece of batting to fit it. Then the question came up as to what should be used for the binding. Lynda got out box after box of fabrics but either one piece was too dark or another too busy. We all liked that particular one but there wasn’t enough of it to bind the whole quilt. Bonnie thought maybe she had some fabric at home that would work. When I left the old school house Friday afternoon, there still hadn’t been a decision made but I know there will be.